I have a gang of friends are big fans of Beauty in The Pot - I'll call it BITP for short. It's one of our favourite hotpot restaurants, with a dreamy collagen broth that kept us coming back. For the longest time BITP only had a single outlet at OneKM Mall. That meant a lot of patience on the phone making reservations way in advance. So when they opened a second outlet at Centrepoint, we had to check it out. It was good that we didn't go immediately after the place opened as there were stories of people waiting an hour for their seats (even with reservations) and then another hour for their food. Luckily for us, dinner went smoothly. We were seated immediately and food arrived quite fast. 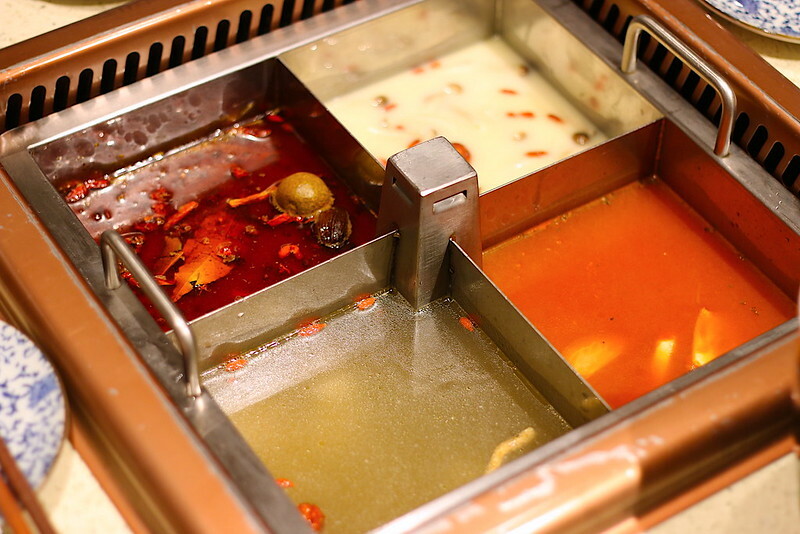 We had the quad-broth tray - mala, collagen, herbal chicken and tomato soup. They were okay but I felt something was missing; the collagen broth just wasn't as good as the broth we knew at OneKM Mall. This seemed somewhat diluted. If they're not going to improve this, I'll stick to their first outlet. Wait, I hope they haven't diluted the broth there now too! We did recognise some of the staff from OneKM Mall there, which lent a nice familiarity to the place. The only other benefit is that this place is open til 6am, so you know where to go if you have a post-midnight craving for hotpot!